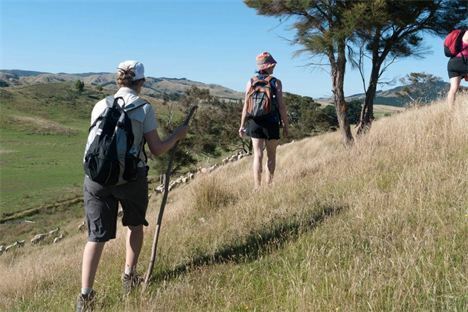 Running from October to April, our season Whareama Coastal Walk activity is a fantastic New Zealand fully catered walking experience over private farmland and isolated Wairarapa coastline. We offer a 2-course evening meal (with glass of wine or beer) option to our B & B guests. Please ask when booking. The Ica Station Homestead B&B is a Category 2, Heritage New Zealand listed building in the Wairarapa, that is now open to the public offering self-contained, Bed and Breakfast and motor home parking accommodation. Surrounded by secluded grounds, our accommodation guests enjoy complete peace and relaxation ensuring they leave fully recharged after every stay. Accommodation options extend beyond the historic homestead and include two ornate holiday cottages available for nightly rental, as well as seasonal walking options. All guests have use of our Swimming Pool and Spa Pool area whilst staying here. Our venue is perfect for couples, families or groups. A Wairarapa wedding, Anniversary celebration, family gathering or small conference meeting place. Combining colonial New Zealand history and charm with modern comforts in a setting that has to be seen to be believed! Guests have limited use of our Wifi and washing machine if required at no extra cost. Please note here in the Wairarapa there is limited mobile phone reception and our broadband is only 5 x faster than dial up! Running October to April, our season Whareama Coastal Walk is a fantastic New Zealand fully catered walking experience over private farmland and isolated Wairarapa coastline. See add on experiences below to include a 1 day walk option. We are 35 mins East of Masterton, situated between the beach resorts of Castlepoint and Riversdale Beach. For a true New Zealand destination rich in history and beauty! - Price includes continental breakfasts. *Cooked breakfast by arrangement only - $20pp extra - please add on as an extra below. *Please also note we offer a 2 course evening meal - please add on as an extra below if you wish to include it. Ica Station Whare is a 1 bedroom whare located in the beautiful landscaped gardens. You are right next door to the main house, where you have access to a swimming pool and spa pool! The Whare is fully furnished and has a small kitchenette, with two ring stove, oven, microwave, kettle and fridge freezer, so you are totally self-contained. There is no petrol available to buy out here at Ica, so please fill up in Masterton on your way through! - Price includes all bed linen, towels, tea/coffee provisions, plus shared use of spa pool/swimming pool area. - Pets at cottages (not B&B) strictly by prior arrangement ONLY, please email info@otbt.co.nz to request your pet booking, extra charges may apply. India House is a stand alone 3 bedroom (self-contained) cottage situated in the grounds, overlooking an ornamental lake, with shared access to a swimming pool and spa pool area! Wood burner in living room with all fire wood supplied. Enjoy a sheltered spot in our Orchard Paddock to put your motor home or self-contained caravan. Electric and fresh water is available, but no toilet or shower facilities. Our motor home/caravan guests have use of our swimming pool and spa pool facilities at the main homestead. 2 course evening meals and cooked breakfasts are available as extras to your stay. Bed and Breakfast accommodations include continental breakfast. We are Carmen & Richard Tredwell - originally from the UK, we've lived in New Zealand for the past 14 years. We own a beautiful historic homestead B&B and two ornate holiday cottages all set in 20 acres of landscaped gardens. We enjoy having visitors come and share our 'little piece of paradise' here in the Wairarapa, on the East Coast of the North Island!